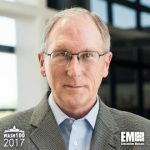 Executive Mosaic is glad to introduce CSRA CEO Larry Prior as the latest member in the 2017 Wash100 — Executive Mosaic’s annual selection of the government contracting arena’s most influential voices. Prior has led the government technology services contractor since its November 2015 separation from Computer Sciences Corp., where he led the former CSC U.S. public sector business from late 2014 and through its combination with SRA International to form CSRA. Since its launch, CSRA has sought to position itself as a primary broker and systems integrator for federal agencies seeking to acquire new technologies in areas such as cloud computing, cybersecurity, digital services and data analytics. Partnerships with other vendors have been key in CSRA’s efforts to become “Customer Zero” for the federal government. “With the full involvement of our line organizations, we develop and invest in our partner relationships, especially our seven strategic alliance partners: Amazon Web Services, Cisco, Microsoft, Oracle, Salesforce, SAP and Service Now,” Prior told investors in a Feb. 7 conference call. Prior cited CSRA’s own transition of its workloads to Amazon- and Microsoft-run cloud environments as an example of how to gain experience with tools available in the marketplace that agencies also are interested in. “We think as a company committed to next-gen IT, you have got to walk the talk and all of your workload ought to be in the cloud. We think you couple that with our own private cloud capability, it’s a nice troika that gives any government customer really good choices,” Prior said in the call. On the financial performance front, CSRA has targeted its 2018 fiscal year that starts in April for the beginning of organic sales growth in a long-term range of 2-3 percent.